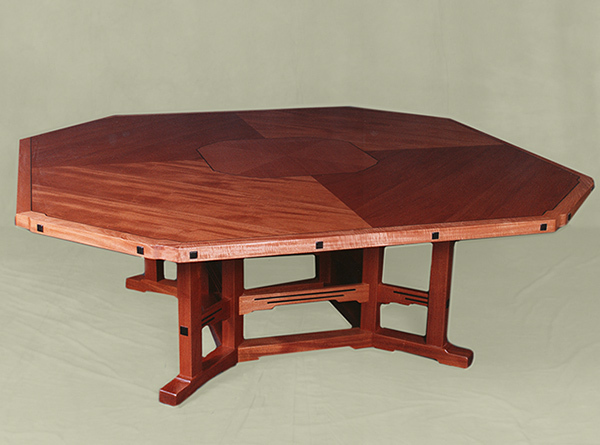 This large octagonal shaped dining table was crafted of select Honduras Mahogany Veneers and Solid Mahogany Wood. The table features a diamond pattern veneer top with a center panel of Figured Pommele Mahogany Veneer. The fine veneer work is accented by delicately curved Ebony inlay and Ebony onlay accents at the table edges and base. Finished in a natural Lacquer finish and hand polished, this table brings grace and dignity to the fine home where it abides.